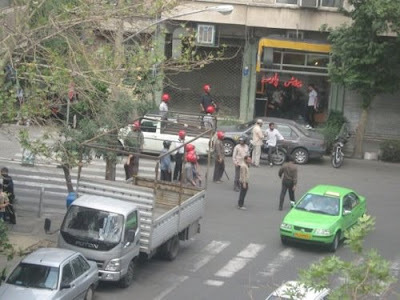 Protests continue in Iran today, even after Ayatolla Ali Khamenei warned the people that any further protests in the street would be suppressed by the power of the state. My favorite line from the speech might have been when Khamenei tried to explain that up to a millian votes might be stolen, but not the eleven million Mahmoud Ahmadinejad stole. Below are picture from the live blogging on Huffington Post. 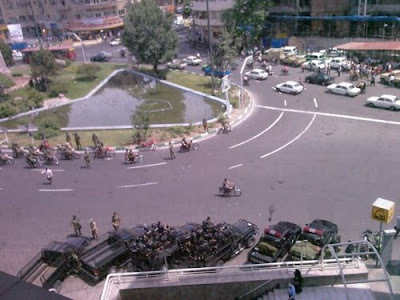 They show Basiji militia waiting to stop the protestors before they reach Ferdosi Square. Pictures were taken at approximately Noon local time. The bravery of the Persian people, especially the women who are treated as little more than chattel, deserves our support. I am so proud of the US House of Representatives for their resolution supporting the Iranian people and their right to protest this hoax of an election and condemning the crackdown threatened by the Supreme Leader. My own Congressman, Republican Jim Gerlach (PA-6) tweeted the good news just after the vote was official. I am disgusted by Ron Paul and is single 'Nay' vote. A true isolationist, he deserved to be isolated. Never again will I acknowledge him as a leader. It is being reported that a bomb has gone off near the mausoleum of Ayatollah Khomeini. Tweets fast a furious denying that this is the work of the green protesters. Most believe this is the government's attempt to discredit the movement and impose martial law. Violenece will beget violence, and Ahmadinejad is playing a dagerous game. May God look down upon the Persian people and guide them through this darkness.